This project was successfully launched in January 2016 in collaboration between Miki Maths, Trinity Presbyterian Church, and Charisma Community Church. The project has been supported by MacRobert Attorneys. In 2016 we focused on providing support to crèches (grade RR) as well as primary schools (grade R). 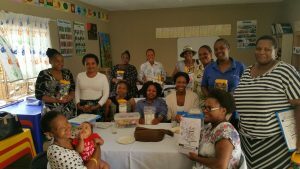 A decision was made based on experience gained in 2016 to focus on supporting the crèche network only. Crèches in the vicinity of Charisma have been identified to participate in the project. There are 18 participating crèches, together supporting around 500 learners. Charisma provides training space and acts as the central community hub. Each practitioner is equipped with a kit consisting of various manipulatives. Children each have a visual perception and numeracy workbook which is used daily. Training is done by Miki Maths and involves quarterly training. Each quarter comprises 9 weeks of activities and work. Practitioners are equipped to do concrete activities to develop conceptual understanding. The intention is that practitioners are equipped to work with larger groups of children. The Drop-In-Centre opened in 2003 and supports around 35 primary school children each year. The children are welcomed each day after school. 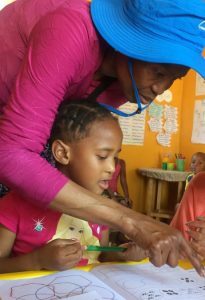 A cooked meal is prepared for them, they are helped with their homework, interact with educational and outdoor games, participate in daily worship and are given care and encouragement. 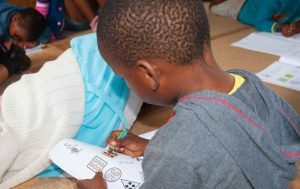 A dedicated Miki Maths practitioner spends two afternoons each week working through the Miki Maths Programme with the children attending the Drop-In-Centre.